Painfully and slowly digging myself out of boxes. Spent a good half hour or more with both me and J tearing up the apartment looking for the X100 charger earlier today. This is the only remotely presentable part of the apartment so far. 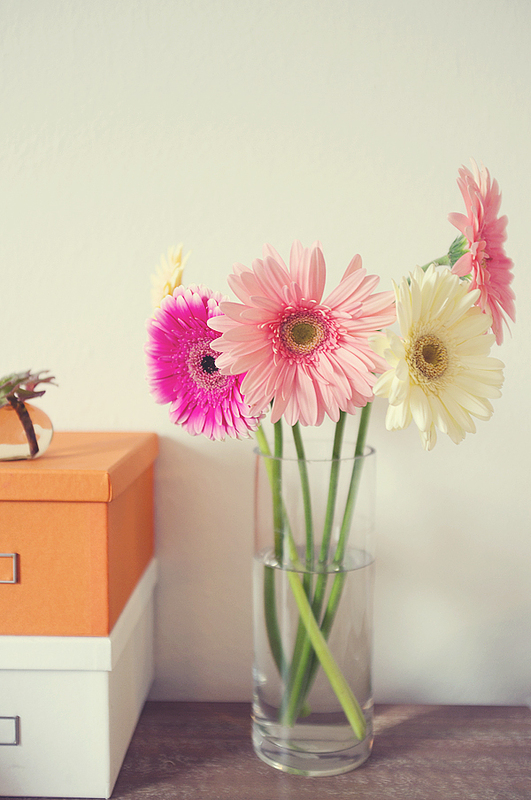 Gerberas (thank heavens my favorite florist in the city is finally back from summer vacation) on my new office desk. Insanely busy week ahead (a good thing!). Hopefully I can get back to regular posting though. good luck with the busy week! Even though it's a tiny corner, looks gorgeous already! :) So much light!! Good luck with your busy week, dear. Looks like you're living in a place with some good natural light this time :D Hope the move is going well!